Seems an appropriate time to upload this photo. 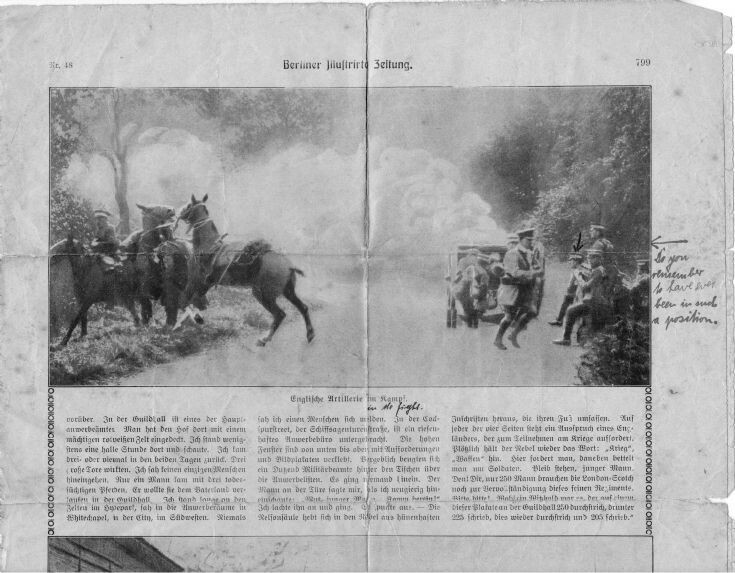 I scanned it from a copy of the Berlin Illustrated Magazine dated November 1914. It shows my grandfathers artillery regiment under fire in Germany 100 years ago. He is to the right of the photo with the arrow pointing down to him. The arrow and margin text were added by a comrade in arms and the magazine sent on to him later. Hi there,without offence or sounding being pedantic, it would be nice to rename this photo as 'British Artillery in Action", as there were also Scottish, Welsh and Irish involved in the war, not to mention Colonial Forces. The literal translation of the original German caption is 'English Artillery in Action' and to my mind doesn't need changing. (Some additional explanation could always be given.) We mustn't be as PC as the Scottish soldier in France who, incensed by notice-boards and posters saying Gott Strafe England, amended them to read Gott Strafe Britain! With reference to the above, I was at the Scapa 100 conference at the weekend and one of the speakers who shall remain nameless kept calling the navy the 'English Navy' When I tackled him about it he was most indignant and insisted as it was formed under Henry VIII it was technically the 'English Navy' and when I mentioned that when the band master of the Marine Band announced at their concert he was going to play the 'English National Anthem' and there was a near riot,he said that it was written for an English King. I won't be going to any of his talks again.